For more information on the .NET Compiler Platform, click here. Diagnostic with Code Fix (NuGet + VSIX): Create a live code diagnostic that comes with a code fix and plugs into Visual Studio as either a NuGet package or a VSIX extension. Code Refactoring (VSIX): Create a refactoring that plugs into Visual Studio as a VSIX extension. Stand-Alone Code Analysis Tool Create a command-line application that uses the .NET Compiler Platform to generate, analyze or transform C# or Visual Basic code. Diagnostics deployed as a NuGet package travel with the user's project and participate in builds. Diagnostics and refactorings deployed as a VSIX extension apply to all projects and work just in the IDE. 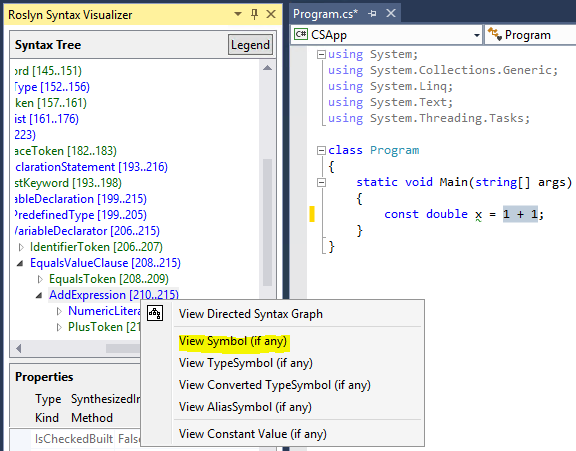 The Syntax Visualizer is a Visual Studio extension that allows you to inspect and explore the syntax trees used by the .NET Compiler Platform ("Roslyn"). This tool will be your faithful companion as you build your own applications and VS extensions atop the .NET Compiler Platform APIs. For more information about using the Syntax Visualizer, check out the github page. 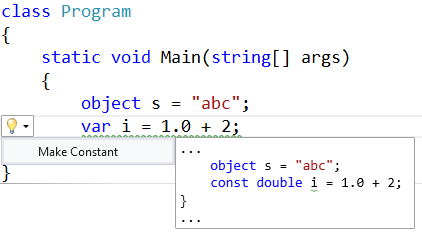 The templates in this package require Visual Studio 2015 and the Visual Studio 2015 SDK. To keep your box clean, you can instead use a prebuilt Azure VM image with VS 2015 already installed. You'll still need to install the Visual Studio 2015 SDK on top.